As Diplomat readers are well aware — and the Pacific Realist is frankly sick of —China has mounted a sustained campaign demanding that Tokyo take a “correct” view of Imperial Japan’s unspeakable crimes during WWII. There’s always been a good deal of irony to all of this. Although far too many Japanese leaders have tried to shrink or even deny the crimes of Imperial Japan, including its atrocities in China, successive Japanese governments have acknowledged and apologized for many of these. On the other hand, the Chinese Communist Party has also committed numerous massacres of Chinese since establishing the People’s Republic of China. This began early in its tenure while consolidating its control over the vast country, as Frank Dikötter notes in a terrific recent book. With regards to the “land reform” campaign alone, for instance, Dikötter writes, “The exact number of victims killed in the land reform will never be known, but it is unlikely to have been fewer than 1.5 to 2 million people from 1947 to 1952.” At least another two million were killed in the Great Terror that Mao launched between 1950-1952 to weed out imaginary counter-revolutionaries. Of course, there was also the widespread famine that killed tens of millions during the Great Leap Forward. To be sure, there’s no reason to believe that Mao and the other CCP leaders intended to starve these people when they launched the Great Leap Forward. That being said, they continued these policies for years after they realized the disastrous outcomes they were having simply because Mao didn’t want to admit his failures. Then, of course, the entire country was plunged into chaos once again during the Cultural Revolution, which was Mao’s attempt to ensure his atrocities weren’t publicly acknowledged by the Party after his death. As it turned, he needn’t have worried as the CCP under Deng Xiaoping decided it was not in the Party’s interest to acknowledge it had nearly destroyed the county many times over in its first 25 years in power. Instead, the CCP has devoted considerable resources to systematically rewriting history — or at the very least burying it. Unlike in Japan, where history is distorted by hardline leaders, in China distorting history is the official state policy. Meanwhile, taking the correct view of history is illegal — which is why books like Tombstone are banned. Reasonable observers might conclude that it is the height of hypocrisy for the CCP to wage a global PR war over Japan’s views of history on the one hand, while on the other hand criminalizing a correct view of its own history. And there was a time not too long ago I might have agreed with these reasonable observers’ conclusion. However, this week Xi Jinping and the CCP took their hypocrisy on history to new heights. She went on to note that President Xi and the entire Politburo Standing Committee participated in the new Victory Day celebrations, which they used mostly to criticize contemporary Japanese policy, and to try to create the impression that Japan’s shifting defense posture represents a return to the militarism of Imperial Japan. None of this is particularly new. The CCP has long claimed credit for having tirelessly defended China from the Imperial Japanese army. This couldn’t be further from the truth, however. As I have noted elsewhere, Japan’s invasion of China saved the CCP from Chiang Kai-shek and the KMT, and ultimately allowed Mao to defeat the KMT in the ensuing civil war. Indeed, by the end of 1934, the CCP was on the verge of extinction after KMT troops delivered another heavy blow to the Red Army in Jiangxi Province, which forced the Party to undertake the now infamous Long March to Xi’an in the northwestern province of Shaanxi. Chiang initially pursued the Communist forces, and would have almost certainly delivered a final blow to the CCP if war with Japan could have been delayed. 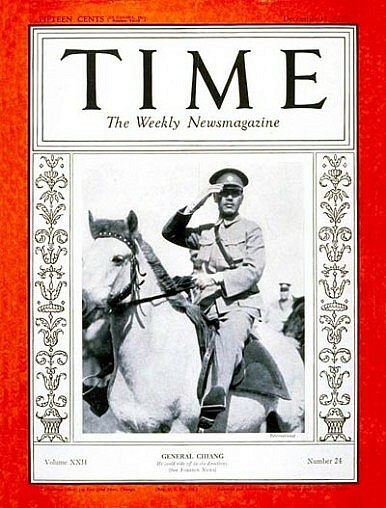 As it turned out, Chiang was not able to put off the war with Japan any longer, and domestic and international pressure forced him to accept a tacit alliance with the CCP against Japan. At the onset of the war, then, the CCP was not in any position to defend anyone from the formidable Japanese military. In fact, it wasn’t even in a position to defend itself from the KMT. The initial battles of the second Sino-Japanese War in southern China were the largest ones, and the KMT fought them alone. By the CCP’s own accounts during the war, it barely played a role. Specifically, in January 1940 Zhou Enlai sent a secret report to Joseph Stalin which said that over a million Chinese had died fighting the Japanese through the summer of 1939. He further admitted that only 3 percent of those were CCP forces. In the same letter, Zhou pledged to continue to support Chiang and recognize “the key position of the Kuomintang in leading the organs of power and the army throughout the country.” In fact, in direct contradiction to Xi’s claims on Wednesday, Zhou acknowledged that Chiang and the KMT “united all the forces of the nation” in resisting Japan’s aggression. While the KMT were busy uniting the country and fighting the Japanese military, CCP forces spent much of the early part of the war hiding in the mountains to avoid battle. As the KMT was decimated by the Japanese military, it was forced to retreat further south. At the same time, the Japanese forces largely focused on securing control of Chinese cities and strategic infrastructure, while ignoring China’s massive countryside. Thus, the KMT’s efforts to actually defend China created a power vacuum in rural areas, which the CCP came out of hiding to seize. It used its control over these villages to perfect its propaganda and political efforts, and hid among the population to avoid fighting the Japanese army. According to Soviet military advisers stationed in CCP-controlled areas at the time, the CCP also used this land to grow opium to fund its growing operations. As far as fighting went, the CCP engaged in guerilla warfare and sabotage missions. This certainly annoyed the Japanese forces, but it did not have a significant impact on Japan’s war operations. In fact, even the Japanese North China Area Army — which had command over the northern areas where the CCP was located and the KMT was relatively weaker than elsewhere —continued to see defeating the KMT as its primary objective. The greater impact of these guerilla operations was in helping the CCP win new recruits. The CCP used their “heroic” operations against the hated Japanese enemy to recruit young men (and women) to their cause, much as militant groups like the Islamic State of Iraq and al-Sham film their exploits today and post them on YouTube to attract recruits. This was highly successful. According to the CCP’s own estimates, it began the war with 30,000 troops. By Victory Day, it had 1.2 million regular troops and around 2.6 million to 3 million militia under its command. It was also quick to seize the areas that the Japanese army was vacating, and seized the Japanese equipment. In fact, in some instances it even forced the Japanese soldiers to join the Red Army (the KMT did the same). Of course, the war not only allowed the CCP to grow much stronger, but it also greatly depleted the Nationalist’s strength. This allowed the CCP to prevail easily in the civil war. This was not by accident but by design. The CCP had a choice: it could have prioritized defending the country against Japan during the war, or it could have prioritized seizing control of China from those who did fight the Japanese. It chose the latter. Meanwhile, by choosing to actually try to defend China against Japan during the war, the Nationalists handed the country to the CCP afterwards. Which is why Xi and the CCP’s decision to create a national observance day to honor its defense of China during the second Sino-Japanese War represents the height of hypocrisy. It’s one thing to try to suppress all information exposing the Party’s failings, which killed millions of Chinese, while demanding Japan take a correct view of history (which Tokyo should do). It’s another thing altogether to falsely claim credit for one of the defining moments of your country’s modern history. And it’s really something unprecedented to create a national holiday to honor your Party for doing something it consciously avoided; namely, putting China’s defense over the CCP itself. Classy.